question asked: Mar 25, 11:26 a.m.
last updated: Mar 25, 11:26 a.m.
Not able to upload RFT log into the RQM. Why in P2 plugin/Eclipse MARS Process Configurations not active? Why don't I see a resolution date in my Work Item history for one of my projects? 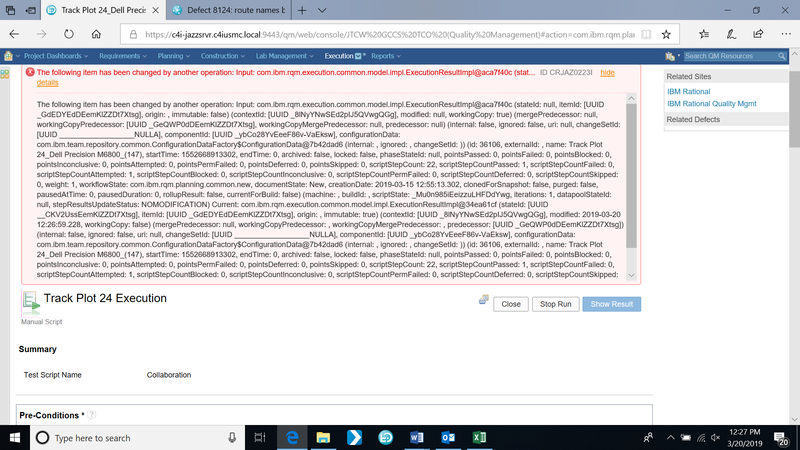 ava.security.cert.CertPathValidatorException: Certificate chaining error Test connection FAILED! what would cause these errors in QM? Matthew Clark (78●2●12) | asked Mar 25, 11:26 a.m.
running CLM version 6.0.6 with iFix07. Only 1 user is getting these errors, and he is consistently able to reproduce. None of the admins can reproduce this.